15 (18)" circumference. Hat shown measures 18". -Finished Size: 15 (18)“ circumference. Hat shown measures 18”. -Yarn: Cascade Yarns 128 Superwash (100% superwash merino wool; 128 yd 117 m/3 1/2 oz 100 g): #858 ginger (A) and #1961 camel (B), 1 skein each. -Needles: Size 6 (4 mm): 16” circular (cir). Size 9 (5.5 mm): 16” cir and set of double-pointed (dpn). Adjust needle size if neces¬sary to obtain the correct gauge. -Notions: Marker (m); tapestry needle. 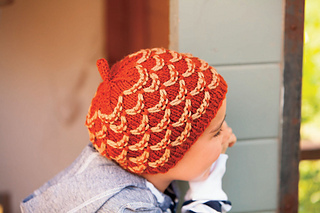 -Gauge: 16 sts and 30 rows = 4” in charted patt on larger needles. 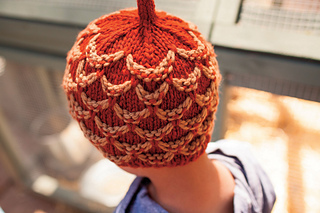 This cute hat works up quickly in an easy slip stitch pattern that looks like a pinecone. 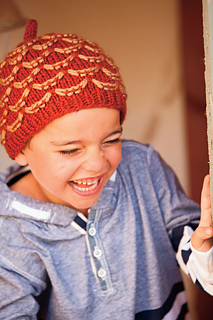 The chunky yarn is soft and machine washable –perfect for your little one!